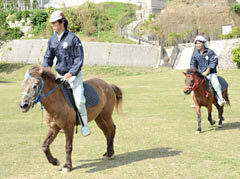 On February 1, at the Okinawa Kodomo no Kuni in Okinawa City, riders receive the ambling gait training with Yonaguni uma and Jeju horses for the uma-harase event. The Okinawa Kodomo no Kuni, Zoo & Museum, is working to resurrect Okinawan traditional horse racing called uma-harase, which was lost almost 70 years ago because of the war. Since last October, zookeepers are preparing the unique racing style using the Yonaguni uma horses that are a native breed from Yonaguni Island, and the Jeju horse from Korea. 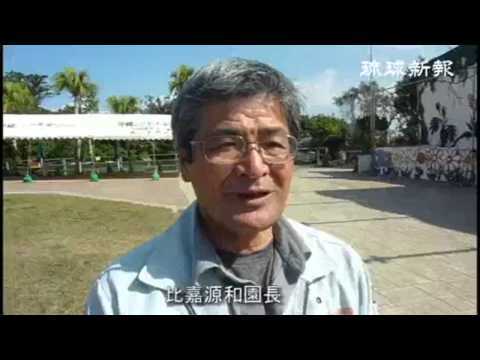 On March 2 and 10, the traditional horse racing will be held at the zoo. Genwa Higa, the chief zookeeper of the Okinawa Kodomo no Kuni said, “Uma-harase highlights an aspect of coexistence between humans and livestock, and is a valuable cultural asset that has its origins in people’s lives. It also has value as a tourist resource.” He is eager to revive and to further establish the event. It is said that the warrior class began uma-harase during the Ryukyu dynasty, but that it spread to be held among ordinary people such as farmers when the warrior class moved to the rural areas from Shuri after the abolition of feudal domains and the establishment of the prefecture. This event was horseracing involving the small native species of horse. The demand for war-horse type varieties increased, and after World War I it was ordered that existing breeds should be castrated. The breeding of large horses meant that the native species died out and so uma-harase was discontinued. Uma-harase was held as a part of events such as hama-uri on March 3, in the lunar calendar, an event called abushibare in which people used to repel harmful insects on April 15 and on a full moon night on August 15. At that time, owning a racehorse was a symbol of prosperity and families were proud of winners in uma-harase. In the uma-harase held in Chibana, Okinawa City, the riders wore festive uniforms made of Chibana hana-ui textiles that are designated as a Japanese traditional craft item. They will appear in clothes made of Chibana hana-ui woven for the one-day event to be held in March. The most attractive feature of uma-harase is the horses’ unique style of running, in which they compete on the beauty of the performance and pace in running parallel one-to-one, without competing in terms of speed. The race is held with the horse moving its left front and rear legs and right front and rear legs at the same time. Higa explained that the ambling gait suppressed the shaking of the horse’s back and helped to prevent luggage falling from the horse. He also thinks that this method might have developed in Okinawa to ease the burden on horses walking through the hills and valleys.